The book sounds deep and heart rending, it must be very good. I don't think there are very many books out there for stroke survivors. But I am betting that you will be writing one in the not too distant future, you are my hero!!! Strokes run in my family, and I have been on blood pressure pills ever since I was extremely young. Ginny, I amglad you are taking steps to regulate that bood pressure! I have a friend who survived (and thrived afterwards) an aneurism in the brain. She told me about this book. I also watched Jill Bolte Taylor recount her experience in a video a few years back. It is quite fascinating. I'm sure it can be found on YouTube. and don't forget your own book - or whatever way you continue to tell your own story. Since there are those of us who are maybe one breath away from a similar experience or know of someone who has taken that breath, this would be a great read. I'm with Marcia, hope you are working on your own book. There is a need. thanks for sharing this and your stroke journey with us. the youtube is a great idea. and i am thinking it will have others things to, like exercises for arthritis, i will check it out. Thanks for the tip about the book. We never know when we may need it. Ed's had high blood pressure for years, and is on meds for it. I always say "Is there anything that you can't find on Youtube?" I never dreamed they had rehab videos. 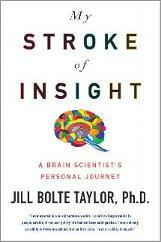 The book sounds like required reading for all of us, stroke or no stroke. I'm so glad you have Walter there to be your mainstay through this. As others have said, keep writing. There's a book in there too.